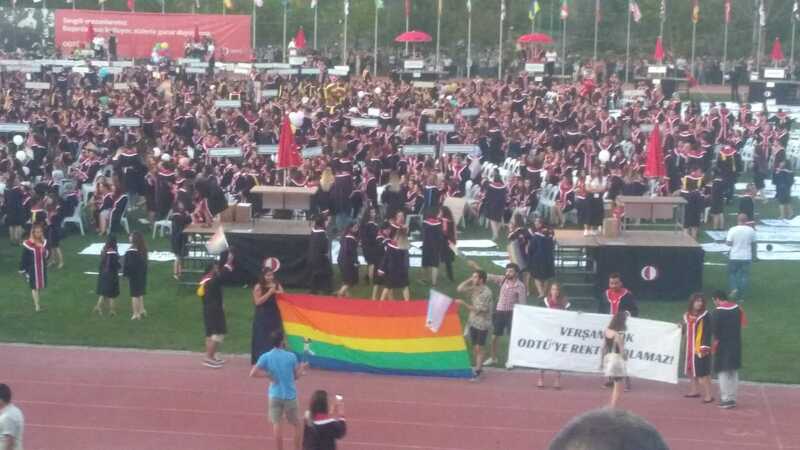 After the investigation of LGBTI+ Pride March in Middle East Technical University (METU), a new investigation has been opened for raising LGBTI+ flag during the graduation ceremony. Another wave of investigations has been started following the ones opened against students who participated the march and allegedly hanging rainbow flags on the school buildings during the LGBTI + Pride March at METU. Reason of the new investigation is the rainbow flags raised during Rector Verşan Kök’s speech in the ceremony. Is rainbow flag a crime factor? Students under investigation told KaosGL.org that more than twenty students from different departments started to be investigated. During their plea, following questions were asked: “Flags are crime factors. Did you distribute them?”, “Did you disseminate the flags for protest?”, “Are there whistles for protest?”. “A lot of students were actually carrying flags during graduation ceremony, but as we understood from the investigation process they know that they cannot investigate that many people, so they decided to oppress activists instead. For many years, METU LGBTI+ Solidarity Group has already been disseminating rainbow flags to whom want to carry during the graduation. Especially in recent years, both students and academics increased their support for LGBTI+ rights struggle at METU, so authorities try to block this support with investigations. What happened in METU so far? METU LGBTI+ Solidarity Group has not been allowed to be an official university group for decades, but continue working to ensure and protect LGBTI+ human rights. In last June, Rectorship declared a ban decision on METU LGBTI+ Pride March. During the gradutation ceremony in 6th of July, private security guards attacked the student carrying rainbow flags and opening a banner saying “We are not just a group of students, but the LGBTI+s of the school. We are here!” and “Verşan Kök cannot be rector of METU”. After the ceremony, on 8th f July, Özgür Mehmet Gür who is from METU LGBTI+ Solidarity Group and the Head of Student Representative Board of METU was taken into custody from his home. A day after the detention, he was released. An investigation has been opened against the student who attended the METU Pride March and allegedly hang rainbow flags on the buildings.